I’ll admit, I am completely and entirely brand-loyal to Pepsi products. I’m not quite sure where this stems from, but I always grew up with Pepsi products in my house and I just think Diet Pepsi tastes better. To each their own. It’s like the great debate over what to call soft drinks: soda? pop? coke? SODA! I broke my brand loyalty to Pepsi and bought a bottle of Coke for this recipe. I know it would have worked just fine with Pepsi, but I’m a little type-A and had to use Coke. Enjoy! 1. Preheat oven to 350F. Spray a 9×13″ baking pan with nonstick spray. 2. In a large bowl, combine flour, sugar, baking soda, cinnamon, and salt. 3. 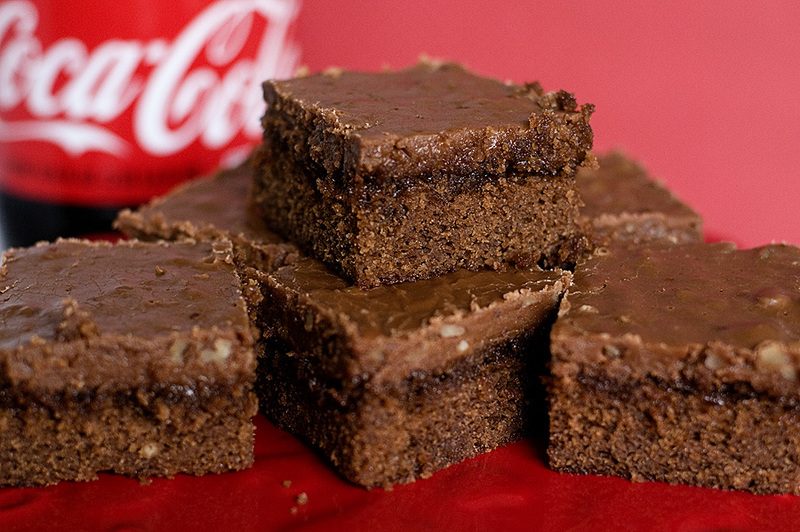 In a medium saucepan, combine butter, Coca-Cola, buttermilk, and cocoa. Bring to a boil over medium-high heat, whisking constantly. Remove from heat, and add to flour mixture, whisking until smooth. 4. Add eggs and vanilla, whisking until smooth. 5. Spoon batter into prepared pan. Bake for 30-35 minutes or until a tester comes out clean. 6. Pour Coca-Cola frosting over hot cake. Let cool for 30 minutes before serving. In a medium saucepan, bring butter, Coca-Cola, and cocoa to a boil over medium heat, whisking constantly. Remove from heat, and gradually add powdered sugar, whisking until smooth. Stir in pecans.